The founding of the Yellowfish Working Group by FOSAF is one of the greatest success stories in angler-driven conservation ever achieved in South Africa or indeed worldwide. Not only have fly fishing resources been virtually doubled in the few short years since the Yellowfish Working Group had its first conference in 1997, but the Yellowfish Working Group has continued to be a shining example of what co-operation between conservation specialists and recreational anglers can achieve. The annual conferences - the eighteenth was held at Thaba �Nchu in June 2014 - continue to provide a platform for academics, conservationists and interested groups to be heard. Many scientific papers have been generated, many vital research projects instituted - to the benefit of the future of South Africa's premier indigenous fly fishing species, the Yellowfish. FOSAF is proud to continue our close association with and our leadership role in the Yellowfish Working Group. "To promote the long-term conservation needs of yellowfish as a flagship group within their natural habitats through sustainable utilisation practices and as a means to create an awareness of their conservation with the relevant decision makers." What does the YWG do? The formation of the Yellowfish Working Group (YWG) was initiated by the Federation of Southern African Flyfishers (FOSAF) in 1997. FOSAF manages the Group and finances its running costs while underwriting the costs of its projects. The YWG can be best described as an 'Interest Group' comprising persons interested in conserving the 9 species of indigenous yellowfish. Among others these persons include sport anglers, aquatic and environmental scientists, tourism operators and their involvement is solely on a voluntary basis. A National Conference is held every year and the Proceedings are published. The Conference Proceedings from 2003 to 2010 are available on this website. Click here for Proceedings. Initially the YWG focussed on the need to popularise flyfishing for yellows in a sustainable manner by practising catch & release (C & R) and this goal was achieved very rapidly. For the YWG's position on C & R click here. More recently the Group has placed greater emphasis on research and the need to combat the very real threat of pollution and habitat degradation. Yellowfish conservation is therefore at the forefront of freshwater fisheries research in South Africa - the main reasons being that these species are sensitive to habitat degradation and are therefore becoming scarce in many of the rivers in which they naturally occur. Because of their sensitivity towards environmental change aquatic scientists are using this fish as a biological indicator of river health. Because yellowfish have become very popular as an angling fish and there is a problem posed by the increasing demand for yellowfish for stocking purposes. By stocking the incorrect species into a river system there is a very real danger of hybridization. This could also apply to distinct genetic groupings within the same species. In ecological terms this could spell disaster for the genetics and thus the long-term viability of the species. Each yellowfish species has its own very specific genetic make-up that has been influenced by its adaptation to specific habitats. Their distribution is the product of their ability to adapt to these various systems where they now occur naturally. Some species are currently restricted to a single river system and are thus very vulnerable. In addition inter-basin transfer schemes such as that between the Tugela system and Sterkfontein Dam represent a similar threat. This problem of hybridization would nullify all the work done to date to conserve the fish and can be regarded as a greater problem than the introduction of alien fish species into these same river systems. In order to establish the status of the yellowfish it has become necessary to assess the genetic integrity of the existing populations where they occur naturally. It has therefore been deemed necessary to map the genetics of all the nine species, samples being taken from the river systems in which they naturally occur. This will help scientists and fishery managers to understand the genetic variation within and between species. The YWG therefore decided in 2001 that a genetic study as described above be given the highest priority and work on the 2 species occurring in the Orange-Vaal system. This work was completed in 2007 with sponsorship provided mainly by AngloGold Ashanti and the results have been published in the Proceedings and are also available on this website. These findings have led to further genetic studies and work on other biological aspects such as breeding are currently being undertaken by researchers who have obtained funding from other sources. Because of the very real threat of hybridization a moratorium was initially placed on the stocking of yellowfish in 2001 and this moratorium was replaced with a policy statement in June 2010 which clearly set out the YWG's stance with regard to stocking and the artificial breeding of yellowfish. Click here for policy. 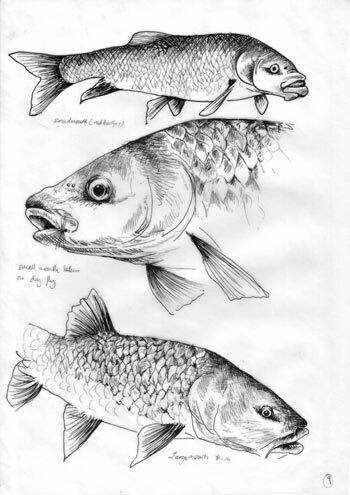 An important project of the YWG and sponsored mainly by the Water Research Commission is the "State of the Yellowfishes in South Africa - 2007 Report". This "Popular Report" which comprises 76 pages in full colour with 100 photos, a detailed distribution map and a poster depicting the upside of clean rivers and the adverse effect of pollution was made available in 2007. To obtain a copy, contact the WRC fax 012-3312565 or email orders@wrc.org.za and quote report K8/719. The cost is R50-00 each plus postage. The project's "Technical Report" was finalized in November 2008 and copies in CD format are available at no charge by contacting the WRC at the numbers or email address above. Another project is the distribution of a pamphlet titled "Sustainable Yellowfishing" which focuses on the need to avoid the trampling of spawning beds during the yellowfish breeding season which is normally between October and March. This problem is particularly noticeable in the heavily fished Vaal River. The pamphlet which has been sponsored by Fishing Owl also gives tips on angling etiquette, catch and release and who to contact at the Department of Water Affairs (DWAF) when reporting pollution. Yellowfish belong to the large cyprinid family and are the largest, scaled freshwater fish of South Africa. Of the nine species present, three are described as threatened or vulnerable -L. capensis, B. serra, and B. andrewi while L.kimberleyensis must be approaching this status. Six of the nine species are true yellowfishes (genus Labeobarbus) while the other three are related species which are loosely termed yellowfish (genus Barbus). Bushveld papermouth - Barbus rapax. Are you interested in supporting the YWG?